With the temperatures dropping, and the prospect of bad weather, winter brings several challenges for horse owners who wish to travel with their horses. Icy conditions and harsh winds may make it more difficult to haul horses safely. This post will help you discover some of the precautions you need to take, and how you can safely transport your horse even during the coldest winter months. When hauling your horse during the winter, you’ll need to make sure that your horse is warm and comfortable. Freezing temperatures require that you shelter your horse as best as possible from the elements. 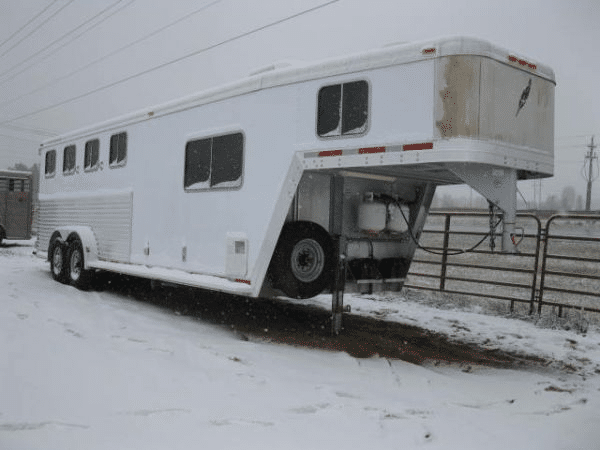 So you’ll naturally want your horse trailer to be tightly closed up to keep out the rain, snow, and chill. However, novice horse owners can easily make the mistake of keeping their horse too warm, so the challenge here is to ensure that the temperature inside your trailer is warm enough but not so warm that the horse overheats. When a horse overheats, it sweats more – and excessive sweating can result in excessive fluid loss. Hauling horses during winter requires that the trailer is well ventilated to prevent overheating and ensure that the horse can breathe easily. Experienced horsemen know to try to maintain a temperature of 50-60°F inside the trailer, if possible. Rest assured that your horses are very comfortable in moderate temperatures. 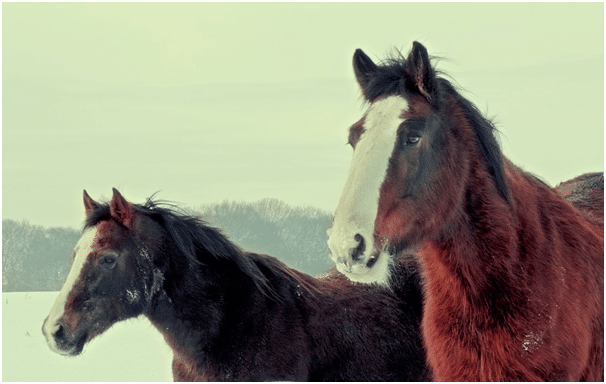 Blanketing is another factor to consider when you’re hauling your horses in the winter. If you’re traveling in extremely cold weather, you’ll need to cover your horse with a blanket. If the trailer is full, however, all of your horses will be giving out sufficient body heat to keep it warm. So it should be enough to cover them up with a sheet. The blanket’s warmth should match the horse’s coat. If your horse is body-clipped, for example, you’ll need to make sure that it gets extra warmth during the colder months. But if the horse has a heavy winter coat, it may not necessarily need extra covering. One of the biggest challenges in winter horse hauling is getting your horse to adapt to the temperature changes between different locations. Your horse will have already adapted to the seasonal temperature where it lives. But if you’re traveling to a location that’s much warmer or much cooler, your horse may have a hard time adapting. Whenever you make a stop, make sure you carefully check for overheating. This means checking under the blanket and observing if there’s any sign of sweating. If there’s any dampness, cold drafts will have a more harmful impact on the horse. So it’s crucial that you regularly check and make adjustments as needed. If you’re traveling for long distances, you need to be thoroughly prepared for long-distance winter horse hauling. You will be driving through regions with different temperatures. So make sure you have blankets of varying weights in case you need to change it due to temperature fluctuations. Hydration is crucial for providing safe transport for your horses in winter. Horses may drink less water during the colder months. When combined with fluid loss due to sweating, this low water consumption can result in dehydration. And dehydration can lead to colic. This makes it vital for horse owners to ensure that their horses are properly hydrated when transporting them during winter. You can tackle this issue by using Restore Electrolyte paste whenever you make a stop. This will encourage your horse to drink and replace the electrolytes they’ve lost. And as mentioned earlier, you should avoid blanketing your horses too warmly as it can result in sweating that adds to fluid loss. Winter often brings with it the prospect of snow. And with snow and ice, the trailer floor can get wet and slippery. This puts your horse at a high risk of slipping, which can result in injuries. 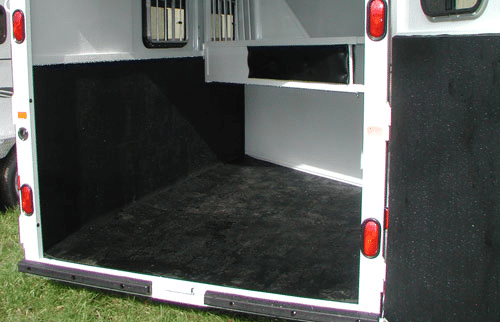 So make sure you use rubber mats on your trailer floor to give your horses some traction and avoid slipping. To further ensure trailer safety, secure all the doors and windows with a latch while you’re loading, unloading, or traveling. This will prevent the wind from unexpectedly blowing them open or shut. If you’re going to cross state lines, make sure you carry with you important documents such as the horse’s certificate of negative equine infectious anemia (Coggins), their current health certificate, and brand registrations. Stock up your trailer with necessary supplies that will last you for the length of the trip. This should include extra water and extra feed. Winter horse hauling requires that you stock more supplies than you usually need in case you get held up by extreme weather conditions. Update your emergency kit with essentials for the winter. This includes shovels, tire chains, candles, matches/lighters, flares, and sand. And in addition to the horse blankets mentioned earlier, make sure you also carry along some blankets for yourself. Have emergency contact numbers ready and visible. Carry along emergency first aid kits for both you and your horses and make sure you know how to use them. These are some of the top essentials you need to remember when transporting your horse during winter. As you can see, winter horse hauling is a complicated process. But if you follow all the tips mentioned above, you should have no trouble safely transporting your horses. Additionally, make sure you drive slowly and safely as the road conditions and visibility may be less than ideal during winter. This leaves you more prone to accidents. So try to avoid taking abrupt actions such as changing lanes, accelerating, or braking quickly. Make sure you carefully check for tire and brake issues before you set off on your journey. If you’re travelling long distances, make regular stops to check for these issues. It’s already hard enough to haul horses in normal weather. During winter, the roads tend to get dicey, making it difficult to control your vehicle and the trailer. If your vehicle qualifies, try to use traction tires to gain better control of your vehicle on wet and murky roads. And don’t forget to use snow chains whenever necessary for both your truck and your trailer. Do you have any horse hauling tips for winter to add? Please share them in the comments below. And if you have any questions, or need any help with your horse hauling needs, please contact us today.